Bring Offers! Best Value in Manatee Oaks. Why wait to build when you can move into this affordable, pool home in the popular Manatee Oaks neighborhood? 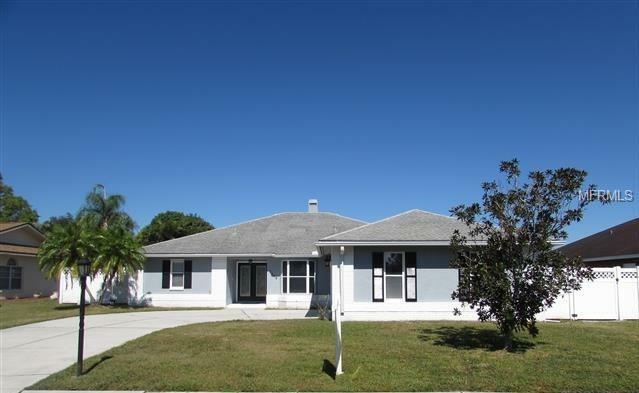 This large, fenced 4 bedroom 2 bath pool home with 2425 sq/ft is ready for a new owner. This is a spacious, split, floor plan with the owners suite one side and all other bedrooms on the other. The family room is complete with soaring ceilings and a fireplace. The kitchen has an eat in nook and the chef of the family will love the newer appliances and induction cook top. Large sliders lead to the screened lanai and pool area. The pool is H-U-G-E and has a new finish and pool deck for easy maintenance. And theres still plenty of yard left because this is a big, .23 acre lot. The owners suite has sliders leading to the pool area and the en suite has double sinks, separate shower and gorgeous new tub. Features include tile on the diagonal throughout the main areas and bamboo and laminate flooring in the bedrooms. The HVAC is new in April 2018, Roof was 2005, Fence was 2006, and the owner is willing to provide a home warranty for the buyer. Manatee Oaks is in a great location with good schools and is in walking distance to the Manatee Charter School. HOA fees are very reasonable at $285 per year and there are no Cdd fees. Easy to show!